Answer: It’s important to learn the difference between intuition and being an empath. Being intuitive means that you are open to non-linear knowledge that comes through gut feelings, ah-ha moments, knowings, sensing energy, and dreams. People can have intuition without being an empath. Intuitive empathy is a form of intuition in which you literally sense and absorb energy and information into your own body from other people. Intuitive empaths are highly sensitive people that can sense subtle energies, emotions, and physical symptoms from others and absorb that energy into their own bodies. It is often difficult for empaths to distinguish someone else’s discomfort from their own. Intuitive empaths are a type of empath that may experience profound spiritual and intuitive experiences such as heightened intuition, telepathy, messages in dreams, animal and plant communication, or have premonitions about the future while awake or dreaming. Intuitive empaths can manifest in different forms. 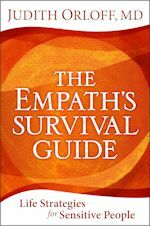 My book The Empath’s Survival Guide describes techniques to learn to deal with empathy in a positive way so you aren’t drained by it.